Trends of 2012: Bows and arrows, what are they all about? Let me just introduce 2012’s bow and arrow trend using a screenshot of a bow and arrow game due to be released in 2013. That’s appropriate, isn’t it? That’s how powerful and remarkable a trend bow and arrows have been this year. They’re leaking forwards and backwards and sideways through time. They have been gaining popularity, those bows and arrows, from Far Cry 3 and Dishonored (sort of) to Assassin’s Creed 3 and Black Ops 2 (sort of). Bow and arrow? Bows and arrows? A bow and an arrow? What a grammatically clunky name for such an elegant and ancient weapon! But what are they all about? And why? First, an admission: there haven’t been nearlyas many bow and arrows in games in 2012 as I had first suspected. It’s essentially onlyFar Cry 3 and Assassin’s Creed 3 towing the bow and arrows line, with Crysis 3 and Tomb Raiderflapping around early next year. The other games I’ve mentioned merely feature crossbows, the lazy man’s bow and arrow, but I’m not going to let that get me down. I’m going to findat least one other 2012 game with a bow and arrows in it, as well as remind you of great bows and arrows of games gone by. But let’s get the upcoming Crysis 3 out of the way. Crytekhave some interesting opinions about bows and arrows, which they’ve shared in the video below. Their bow and arrow is the sort of bow and arrow Robocop would use, a big mess of hinges and brushed metal and high-tensile fibre-wire and rota-scoped laser-sights. The bow and arrow in Crysis 3 looks like it has built-in Wi-Fi for downloading the latest bow and arrow news using archery RSS feeds. It looks like it should have HDMI output. It looks like it could store 14,000 MP3s. It looks like something you’d have to recharge each night. It’s a ruddy futuristic bow and arrow. 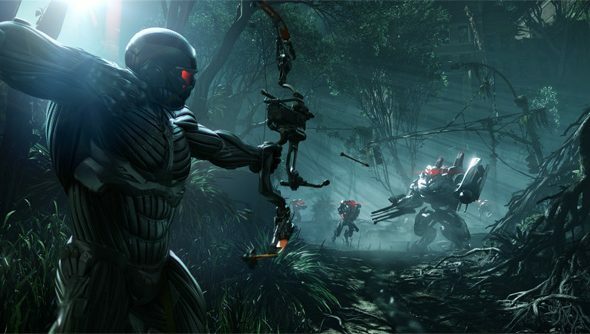 The below trailer for Crysis 3harkens back to the very firstbows and arrows,reckoningthat it’s no coincidence that every culture on earth developed it independently of one another, which is a cool-sounding thing to posit,even though Wikipedia claims that “a number of cultures in historical times lacked the bow and arrow”. Ah well. A unfortunate lack of understanding of the origins of the bow and arrow meansI give Crysis 3’s otherwise excellentbow and arrow:four bows out of arrow. 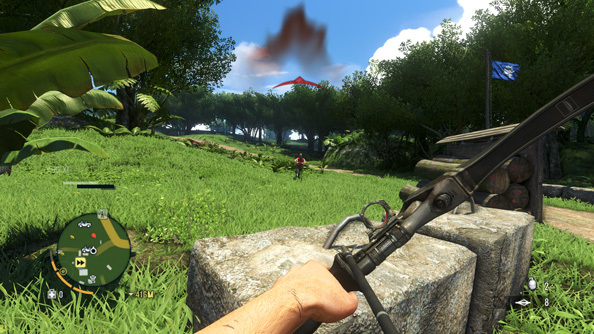 Far Cry 3 has a recurve bow, which is a sort of modern carbon fibre bow used by Olympians and sportsmen. The recurve bow is, in fact, the only bow permitted for use in modern Olympic archery events, and can most often be dismantled into three easy-to-transport pieces. In Far Cry 3 you can shoot a white tiger in the head with it. It take two to three arrows from this bow and arrowto the face to murder a tiger. Far Cry 3’s bow can be upgraded with special optical sights to aid accuracy, though in practice it’s uncertain how useful these attachments are. You can also craft flaming and explosive arrows.The recurve bow is also totally silent (apart from a faint and barely audiblefwip), meaning that if you fire and then swiftlyprance from cover to cover, the game’s red-shirted enemies will have a tough time finding you. That’s the true benefit of using the bow in Far Cry 3. Also, if you fire an arrowdirectly upwards with minimal strength and thenrun forward a little bit, youcan catch the arrow you just launched (firing the arrow with maximum strength apparently launches the arrow into orbit).Sadly no NPCs comment on what a great trick this is. Not even the mouthy ones that hang around the camps you liberate. What a great bow and arrow. Far Cry 3’s bow and arrowgets six bows out of arrow. Similarly, I won’t dwell for too long onTomb Raider‘s bow and arrow, which is another bow and arrow that belongs to 2013. It was, you could argue, conceived and designed in 2012, and so forms part of the trend of rising bow and arrow popularity. 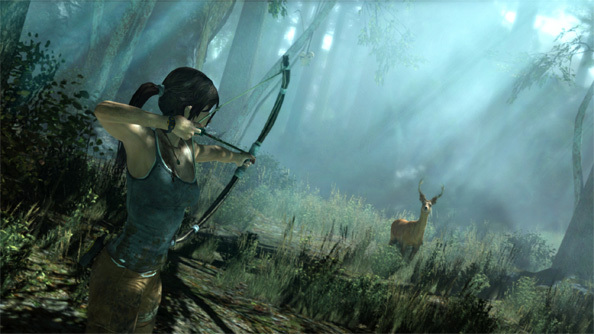 Here’s Lara about to skewer a sub-tropical bovid with her home-grown bow and arrow. She’s not even in cover. At least blokey from Crysis makes an effort of hiding in trees and on the top of the Statue of Liberty’s head. Equally unimpressive is the weapon itself: a make-shift bundle of twigs and twine that looks more likely to snap in half and take out the eyes of everybody within a two hundred metreradius, while leaving all wildlife unharmed and unarrowed. You simply wouldn’t get the tensile strength required to launch a projectileat any sort of practical velocity using such a shoddily constructedbow. Of course, in the game it’s purported to bethe perfect hunting tool, a symbol of Lara’s affinity with the natural world around her. I’m not buying it. I like Tomb Raider but I’m bow-sceptical.None bows out of arrows. Assassin’s Creed 3 is theother game that came out in 2012 to have a bow and arrow in it. Because it’s set way in the past, around the time of theAmerican War of Independence, it has what historians refer to as a “crappy bow”, made, as it is, out of wood and bits of string. But such a primitive-seeming bow comes with its own interesting perks and benefits. Connor’s bow is the fastest reloading ranged weapon in the game, outpacing cumbersome muskets of the era and highlighting the dichotomy of tradition and modernity, the natural and the constructed, the wild and the tame. That is an impressive bow and arrow, and proof positive that your bow need neither be adorned in high-tech gadgetry nor festooned in decorative laser beams to be a truly effective deliverer of arrows. Purity and simplicity wins out, and the only way you could make Assassin’s Creed 3’s bow and arrowany simpler would be if you were to simply chuck the arrows at the deer yourself. I like Connor’s bow very much, and I know this contradicts everything I just said about Lara Croft’s bow, but I’ve been drinking a lot of mulled wine this morning. I’m certain that if I’d reviewed the bow and arrowsin the opposite order the scores would be swapped. But I don’t hand out a score like this lightly, let me assure you. 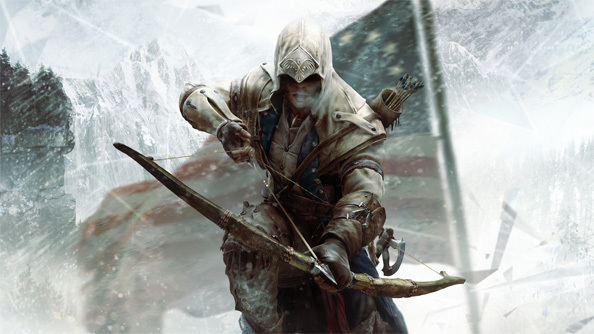 I’m awarding Assassin’s Creed 3’s bow and arrowseven bows out of arrow. 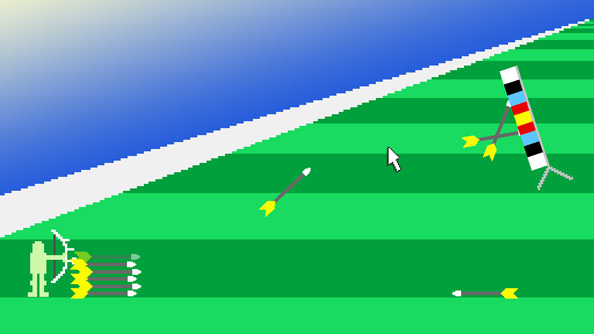 I told you I’d find one other game of 2012 to feature a bow and arrow, and here it is: Realistic Summer Sports Simulator, a free downloadable game in which you must use your mouse and somereal physics to compete in the big Summer Sports games. It includes events such asrealistic weight lifting, realistic 100m dashing, realistic javelin and, of course, realistic archery. Realistic Summer Sports Simulator’s bow and arrow is difficult to appraise as the realistic archery event is performed by dragging the arrows themselves to the target, rather then drawing back on the ‘string’ (or ‘fulcrus’) of the bow itself. This unconventional method of launching arrows (or ‘spirhouettes’, to give them their technical name), while super fun, will sadlycost Realistic Summer Sports Simulator some bows when it comes tothe scores. Speaking of which, I have the score here, in an envelope. Oh, it’sbad news I’m afraid. Realistic Summer Sports Simulator’s bow and arrowonly scorestwo and a halfbows out of arrow. So there we have it.We can all agree that there have been slightlymore bows and arrows than usual in 2012, and while that may not constitute a “trend” — while I may have absolutely failed to adhere to the very straightforward commission assigned to me — nobody can argue that I didn’t write an article about something.